Annual bluegrass could make a nice turf grass. It tolerates low mowing heights, wet, compacted soils and shade. Unfortunately, this plant cannot handle temperature extremes or moisture stress. It will die off suddenly and leave bare spots behind. Fertilization, mowing heights less than 2 inches, and frequent irrigation will encourage or at least favor this weed. This tight clump-forming grass can grow prostrate or erect to 15 in. Leaves are light (apple) green and hairless. Typically, leaves are ½ to 3/4 in. long and up to 1/5 in. wide. They can be puckered or wrinkled and they have a characteristic boat-shaped tip where the end of the leaf looks like a canoe. The ligule is membranous, up to 1/6 in., and slightly pointed. There are no auricles. The collar is smooth and narrow while the sheath is smooth and slightly compressed. Leaves are folded in the bud and the stems are flattened. Roots are shallow and fibrous. 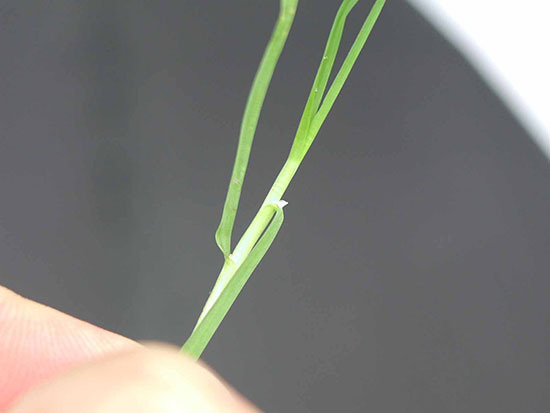 The ligule is membranous and slightly pointed. 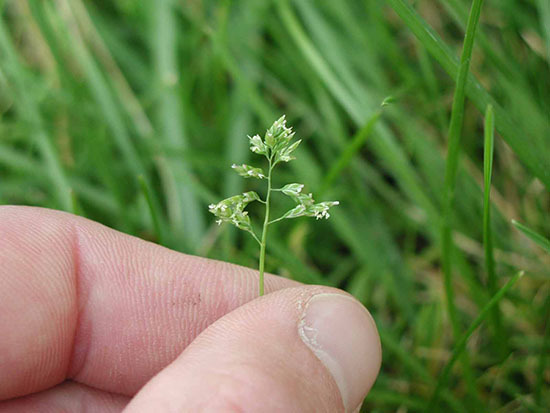 The flowers are greenish-white, open, pyramidal panicles that are 1 to 3½ in. long. Annual bluegrass is a prolific seed producer. Reference books say that it can produce flowers and seeds at only ¼ inch in height. However, I have heard that it is more like 1/8 inch. Regardless, that is pretty short! This smart plant wastes no time in producing seeds. Annual bluegrass is quite noticeable in the late spring when flowers appear. Germination can occur anytime temperatures are above 50°F with the mild weather of fall and spring most favoring germination. Kentucky bluegrass is related and looks similar to this weed. However, it has darker green leaves and is rhizomatous. 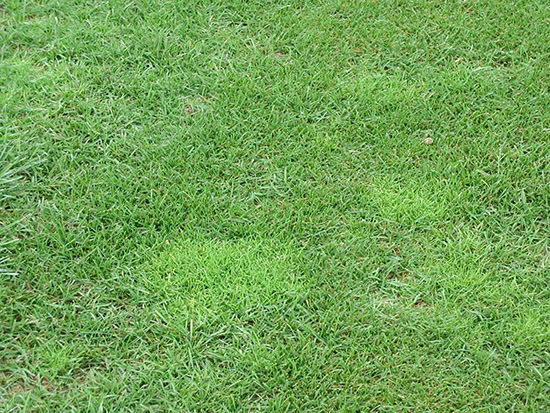 Annual bluegrass is a tough weed to control in turfgrass due to its similar biology. One golf course professional told me once that annual bluegrass is the cockroach of golf turf. Controls vary depending on where this plant is growing. Read labels carefully as the use of some will depend on turf species while others will depend on the type of area. Annual bluegrass seed emergence can be prevented using preemergence herbicides including benefin, oxadizon, pendimethalin, and prodiamine applied in late summer. These herbicides are safe on all cool-season turfgrasses except creeping bentgrass, which is rarely used on home lawns. Bensulide is generally safe on bentgrass and also should be applied in late summer. Other herbicide choices include dithiopyr, and sulfentrazone + prodiamine. An additional application in the following spring can provide continuous annual bluegrass control and will also serve to control typical annual grasses such as crabgrass, foxtails, and barnyardgrass. One thing to keep in mind is that a late summer application of a preemergence herbicide will exclude the possibility of a fall seeding of desirable turf species. Unfortunately, while annual bluegrass is an annual, as the name implies, it can also behave as a perennial. Once established in your lawn, it tends to behave more like a perennial requiring a postemergence herbicide to eradicate it. Preemergence herbicides will prevent additional weed infestation, but to get rid of annual bluegrass it will generally require a postemergence herbicide, unless you"re fortunate enough to get one of those really hot, dry summers that will cause the annual bluegrass in your lawn to die. The light colored clumps are annual bluegrass. Postemergent herbicide options are very limited. Amicarbazone should be applied under cool spring conditions, while bispyribac-sodium (which appears to be going off to the market) should be applied in when weather is warm but not hot, June or late August through early September. Ethofumesate is most effective on annual bluegrass when applied in fall as two sequential applications, however, safety on Kentucky bluegrass is marginal at best.